The Green Vegetation index Colorized map (GVC), colorizes GVI values to show the spatial distribution of vegetation. The index is related to crop vigor, vegetation amount or biomass, resulting from inputs, environmental, physical and cultural factors affecting crops. 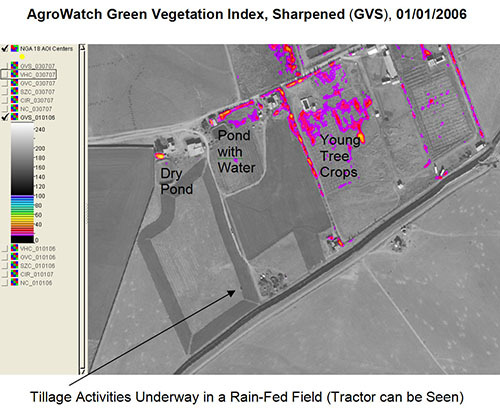 The AgroWatch™ algorithm is applied to calibrated satellite imagesto separate the reflectance of vegetation from variation caused by underlying soils or water. The product is produced for a given field as well as for a region of interest. 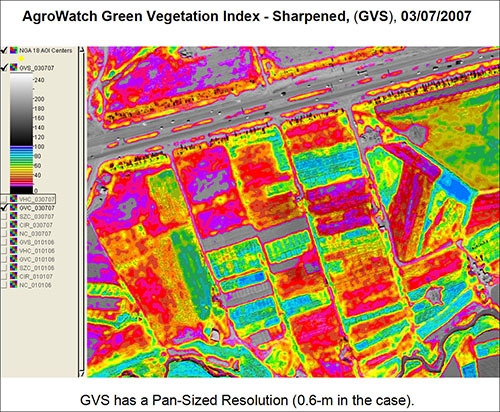 The AgroWatch™ Green Vegetation index - Sharpened map (GVS) is a superior product which combines pansharpened information and GVC values to improve manual image interpretation intended to facilitate the identification and mapping of significant spatial features. Information about green biomass density is contained in the original GVC product which uses colors to show various levels in increments of 5 (on a scale from 0 to 100). GVS uses the registered panchromatic image (collected to make this a visible pan image) to modulate the brightness of each GVC color. The result has the excellent properties of a pansharpened image, but with quantitative numbers that are close (within 2 units) of the original GVC numbers.